You’ve probably heard a thousand times that it’s impossible to train a cat. I admit that teaching your cat to do tricks is more complicated than training your dog, but it’s absolutely doable. As long as the cat is properly motivated and in a mood for learning anything is possible. In fact, you’ve already taught your cat something. She comes when you call her name, doesn’t she? Then you’re ready for the next level. 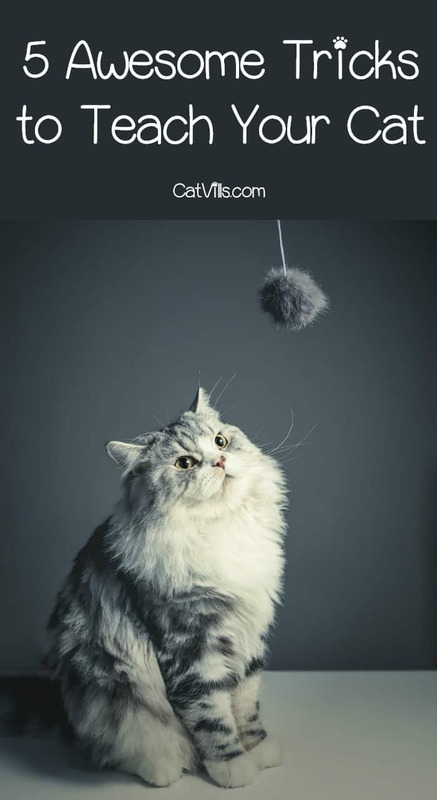 But before we see some awesome tricks to teach your cat that will leave your friends speechless, let’s talk about something else first. What do you need to train a cat? The first thing you should get before starting your lesson is a bag of cat treats. But not any ordinary treats. They should be the most delicious, irresistible ones you can find. If your cat doesn’t like the food, she won’t do what you want and will lose interest very soon. The second thing is that you should always teach the trick in a room with no distractions so that you have the full attention of Kitty. Cats are intelligent creatures and they learn by repeating the same thing over and over again so you should be patient above all. Now let’s see, what awesome things you can teach your feline. When it comes to cat training, it’s always for the best to start with something simple like “sit.” To do that your cat should be in standing position. Take a treat and hold it above her ears or above her head and slowly move it towards the tail. Your cat will be forced to sit to see what you are holding. When she does that, tell her that she’s done a great job and reward her. Then you keep on practicing. Eventually, you’ll introduce the spoken command “sit” and get rid of the food bait. When your cat has mastered sitting, you can also teach her to stand on her hind legs. You just need to raise the food high enough over your cat’s head and encourage her to stand to get her. Simple, right? And watch out for the fingers. Those teeth are sharp. Place the treat over her head and raise it slightly so that she has to reach with her paw to get it. When she does, you should immediately give her a high five and reward her. And don’t succumb to any cute behavior that your cat might use to manipulate you. If there is anything more adorable than “high five”, it’s “give me a kiss.” To teach your cat to do this awesome trick you have to smear something tasty on your finger or your face and let her do the rest. This method works best if the kitty is slightly hungry so start the lesson before feeding time. We’ve all seen so many videos of cats doing their business in the toilet that we’ve always wondered if it’s really possible to achieve this. Yes, it is. And it’s not as complicated as you might think, but it will take time and dedication. First, move the litter box near the toilet and give the cat time to adjust. Then you continue by raising the box closer and closer to the top of the seat. When your cat gets comfortable using the litter box on top of the toilet seat, buy a special cat training seat that fits your toilet and some flushable litter. As time goes by, you can start using less and less litter and eventually get rid of the litter box. I admit that this might be one of the hardness tricks you can teach your cat, but if you want to take your Kitty out for a walk, it’s worth giving it a try. Start by getting your cat familiar with the harness. Don’t secure it at firsts because this might freak out the cat. Let her get comfortable with the feeling of the harness and then secure. Get your cat to spend a couple of minutes every day wearing the harness. When you deem that she doesn’t mind the harness, add the leash. Allow your cat to walk around the house with the leash and harness so that she can get used to it. After a few days, you will be ready to take her for a walk. But keep in mind that cats are temperamental creatures, and despite all your efforts she might refuse to be walked around on a leash like a dog and just lie stubbornly on the floor. Also, some cats might be too scared to go outside their comfort zone (your house), and you shouldn’t force them. Cat training is not impossible as long as the reward is worth the effort from your cat’s point of view. Remember that, and everything is possible. Does your cat know any cool tricks? Was it hard to teach her or was she natural? Tell us in the comments. All of those are pretty awesome tricks to teach a cat! I’ve always wondered how some of them learned to use the bathroom in the toilet. What fun tricks! My kids always love teaching animals new tricks. It gives them a sense of accomplishment. Amazing tricks. My cat hardly listen to me, but I this these tricks will work. Thanks! Awesome tricks! My cats would never take the time to learn tricks. I had a lot of barn cats that I loved, they never would sit long enough either. I have never even thought about training a cat. I figured it would be way to hard. These are great ideas! If we ever have another cat, I am definitely going to try to toilet train them. Awesome tip! I had no idea you could train your cat! That is hilarious. I had no clue cats could be trained to do those tricks! I would love high fives from a cat! Do you find that cats are easier or more challenging to train than dogs? Wow! I never know cats could also learn things like these. Thanks for this very informative tips. My husband would love all these! This is cool. Cats are hard to train but it’s not impossible. Just need the patience and right skills to do so.! My 3 yr old Siberian does Hi 5’s, sits up, rolls over to greet me when I come home, and meows for his favorite treat. Nothing he can’t learn. Thought I would share what my super affectionate Princess Leia does. I have succombed to back problems, anyway, you know how cats have the ever so need to knead… Well, if I’m lying down she’ll jump on my back and do her thing lol… Not enough pressure or in the right spot, but it’s really cute!